Saah Exco was found alone on a beach in Liberia's West Point slum, naked and abandoned and likely an Ebola victim.Research suggests the story of one needy individual motivates charitable donors more than statistics about millions of sufferers. Why do people sometimes give generously to a cause — and other times give nothing at all? That's a timely question, because humanitarian groups fighting the Ebola outbreak need donations from people in rich countries. But some groups say they're getting less money than they'd expect from donors despite all the news. Psychologist Paul Slovic of the University of Oregon has some answers that may surprise you. On a rational level, the volunteers in this second group should be just as likely to help the little girl, or even more likely because the statistics clearly established the seriousness of the problem. "What we found was just the opposite," Slovic says. "People who were shown the statistics along with the information about the little girl gave about half as much money as those who just saw the little girl." Slovic initially thought it was just the difference between heart and head. A story about an individual victim affects us emotionally. But a million people in need speaks to our head, not our heart. "As the numbers grow," he explains, "we sort of lose the emotional connection to the people who are in need." But if the dry statistics aren't as powerful as the emotional message about the little girl, why do the numbers reduce people's emotional response to the child in need? Slovic has done further research that suggests it might not be a case of heart vs. head after all, but of one set of feelings competing against another. The volunteers in his study wanted to help the little girl because it would make them feel good and give them a warm glow. But when you mix in the statistics, volunteers might think that there are so many millions starving, "nothing I can do will make a big difference." Now if the human brain were a computer, the two conflicting feels wouldn't cancel each other out. We would still help the little girl even if we couldn't help everyone. But the brain is a master at unconsciously integrating different feelings. So the bad feeling diminishes the warm glow — and reduces the impulse to give generously to help the child. In other words, people decline to do what they can do because they feel bad about what they can't do. That theory might explain why there hasn't been an outpouring of donations from Americans to the Ebola epidemic. The current outbreak triggers feelings of hopelessness: there's no cure, lots of people are sick, and lots of people will die. "It's really about the sense of efficacy," Slovic says. "If our brain ... creates an illusion of non-efficacy, people could be demotivated by thinking, 'Well, this is such a big problem. Is my donation going to be effective in any way?'" Slovic's research suggests that the way to combat this hopelessness is to give people a sense that their intervention can, in fact, make a difference. That's a challenge for charitable groups — and for journalists. A reporter's job is to tell the truth and paint a picture of everything that's happening. But when you paint the bigger picture, it could undermine people's ability to do what they can to help. 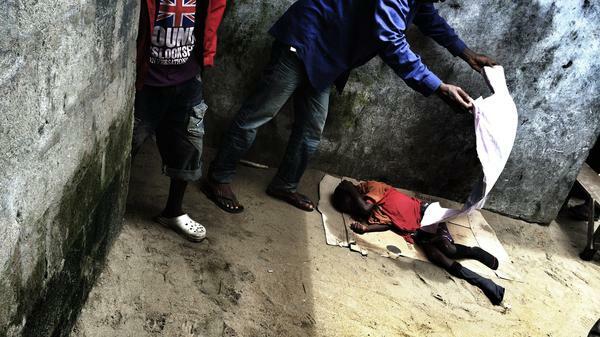 Humanitarian groups fighting Ebola need donations from people in rich countries. But right now, some groups say they're getting less money than they would expect from donors given all the news. Today we look at psychological research into why we sometimes decide to help those in need and why we sometimes don't. NPR's Shankar Vedantam joins us regularly on this program, and he's here to tell us about research that explains why really big problems sometimes attract fewer dollars. Hi, Shankar. INSKEEP: That's kind of counterintuitive. I'm thinking of people I've heard on TV over the years saying, the need is enormous. But this is research saying an enormous need actually makes us less likely to contribute. Why would that be? VEDANTAM: Well, I think it is counterintuitive, Steve. But there is research suggesting that might be a case. At the University of Oregon, psychologist Paul Slovic has been studying why this happens. In one of the experiments he's conducted, he tells volunteers about a little girl who's suffering from starvation, and he measures how much the volunteers are willing to donate to help this little girl. INSKEEP: So a really small, specific problem with one person. VEDANTAM: Exactly. Then he presents another group of volunteers with a story about the same little girl. But this time, he also tells them about the millions of other people who are also suffering from starvation. Now, at a rational level, volunteers should be just as likely or even more likely to help the little girl because the statistics clearly establish that starvation is a serious problem. Here's Slovic. PAUL SLOVIC: What we found was just the opposite. People who were shown the statistics along with the information about the little girl gave about half as much money as those who just saw the little girl without the statistics. INSKEEP: Wow. When you find out it's a huge problem, you give less. Why? VEDANTAM: Well, Slovic initially thought it was just the difference between heart and head. So when we hear a story about an individual victim, it affects us emotionally. But a million people in need speaks to our head. So this is why dry statistics, for example, don't affect us as strongly as an emotional story. Here's Slovic again. SLOVIC: We respond very strongly to a single individual in need, but as the numbers grow, we sort of lose the emotional connection to the people who are in need. INSKEEP: But wait a minute. I wonder if that's all that's going on here because people still did find out about the little girl. They did find out a personal story. But they also found these statistics, and that made them less likely to give. VEDANTAM: Yeah, that's exactly right, Steve. So the question is even if the statistics aren't powerful as an emotional message, why are the statistics reducing people's emotional response to the little girl? So along with Daniel Vastfjall and Marcus Mayorga, Slovic's just finished a series of experiments that suggest it might not actually be about heart versus head, but about one set of feelings competing against another set of feelings. VEDANTAM: Well, when Slovic tests the volunteers, they want to help the little girl because the anticipated will make them feel good. It gives them this warm glow. But when you tell them about the little girl and the millions of others who are suffering, you now trigger two different feelings. Wanting to help the little girl still produces the warm glow, but that feeling is contaminated by a bad feeling about the large number of people the volunteers aren't helping. INSKEEP: So many millions of people are starving that there's nothing I can do to make a big difference in this problem. VEDANTAM: Exactly. Now, if the brain were a computer, these feelings wouldn't cancel each other out. We would still help the little girl even if we couldn't help everyone. But the brain isn't a computer. It's powerful at unconsciously integrating the different feelings we are experiencing. The bad feeling is diminishing the warm glow, and with it, it's reducing the generosity people feel toward the little girl. And this is a sad thing, Steve. People are declining to do what they can do because they're feeling bad about what they can't do. And Slovic thinks this might explain why fewer Americans might be donating to fight the Ebola outbreak in West Africa. There's lots about the Ebola outbreak that triggers feelings of hopelessness - there's no cure, lots of people are going to get sick, lots of people who get sick are going to die. Here's Slovic again. SLOVIC: It's really about the sense of efficacy, and if our brain works in ways that creates an illusion of non-efficacy, people could be demotivated by thinking, well, this is such a big problem, and is my donation going to be effective in any way? INSKEEP: This is reminding me of studies of people's attitudes toward climate change, global warming. People get to thinking, this is such a vast problem that I can do nothing about, so I'll just ignore it. VEDANTAM: That's exactly right, Steve. I think what Slovic's really studying is the effect of hopelessness. When people feel hopeless about a problem, it greatly undermines their desire to do something about it. INSKEEP: What if you're in a government agency or a relief agency and you think, well, actually I really do need people to contribute. It's Ebola. It's in everybody's interest to fight it. What should you do about this? VEDANTAM: I think what Slovic's research suggests is the thing to do is to give people a sense that their intervention can make a difference and to focus on what's hopeful as opposed to what's hopeless. Now, this presents interesting challenges for us. It presents challenges to us as journalists, Steve. INSKEEP: Because we want to tell the truth. VEDANTAM: We want to tell the truth, and we want to paint the picture of everything that's happening. But what Slovic's research is suggesting is that when you paint the bigger picture, it undermines people's ability to do what they can do to help. INSKEEP: That's NPR's Shankar Vedantam. Transcript provided by NPR, Copyright NPR.